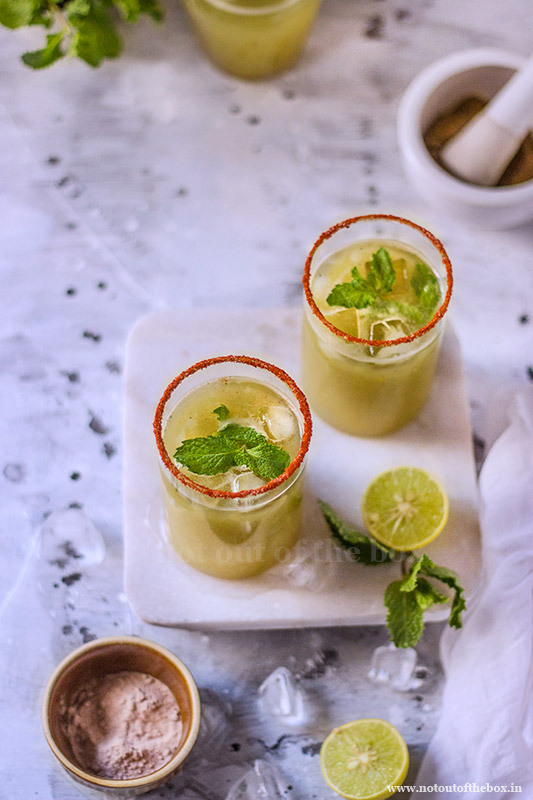 Popularly known as Aam Pora Sharbat in Bengal, this Roasted Raw Mango Cooler is a memory laced drink from my Granny’s kitchen. In the scorching summer afternoon, a typical burnt aroma of mangoes or the tang of roasting the spices were enough to let us assume what would be waiting for us. 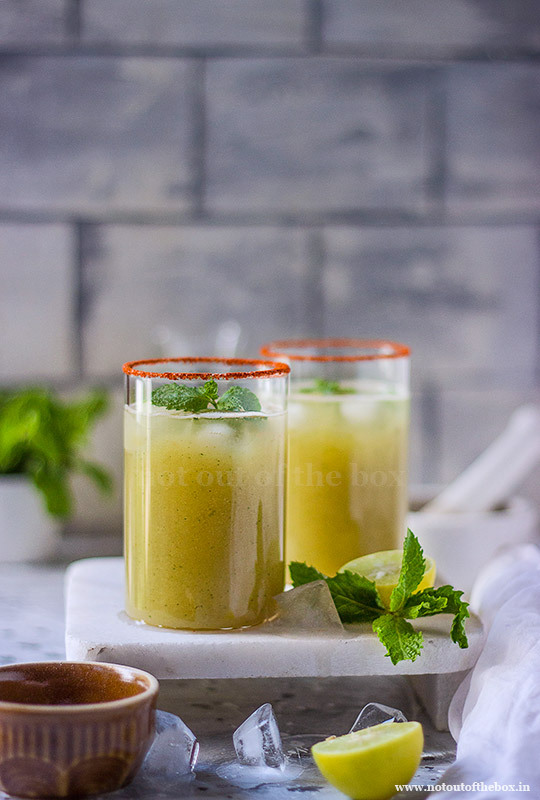 Later came those flower imprinted glass tumblers with pale green goodness, ice cubes were fancy then, every household couldn’t afford refrigerators. The big earthen pot in the kitchen corner was the never-ending source of cold water supply all through our childhood days. 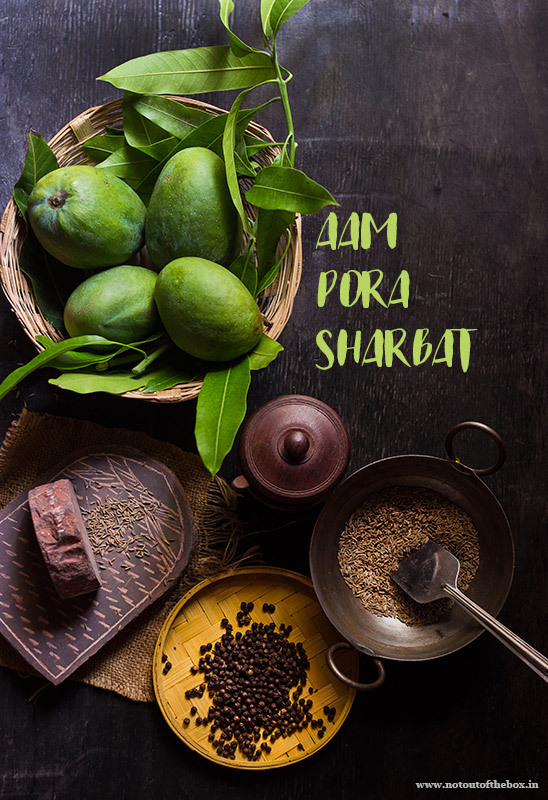 It was believed that roasting of Raw Mangoes would finish off the heat of the fruits, and consuming a drink made of them will reduce the body temperature during summer. The heat of the fruits will go or stay didn’t matter to us, it was the smoky aroma of mango pulp which was so intoxicating that requesting Granny to make this cooler on every other day was one of the numerous activities we used to do during the summer vacation. Her rolling eyes and mock scolding wouldn’t help definitely, and we ended up getting our favourite summer drink in plenty. The mango tree in the backyard was in our favour and never disappointed us with its bounty. Place the raw mangoes on a BBQ hand-held grill, start roasting on the stove top, and keep the heat low. 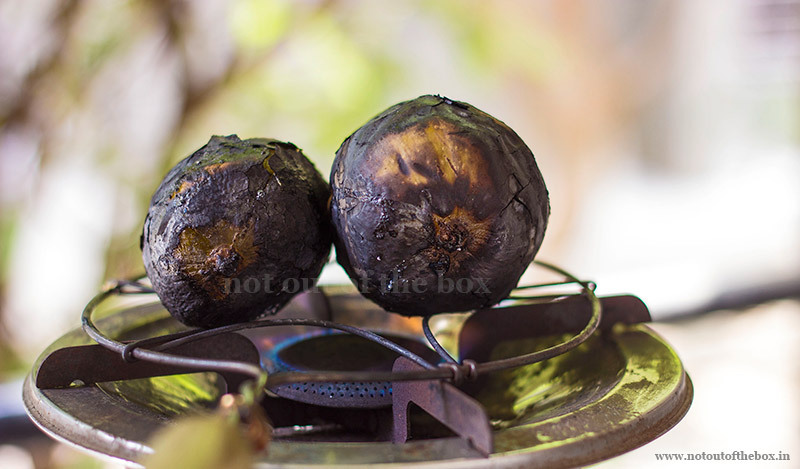 If not using a stove top, the raw mangoes can be barbecued also. Rotate the raw mangoes while roasting, so that they can be charred evenly from all the sides. This will take 15 minutes approximately. 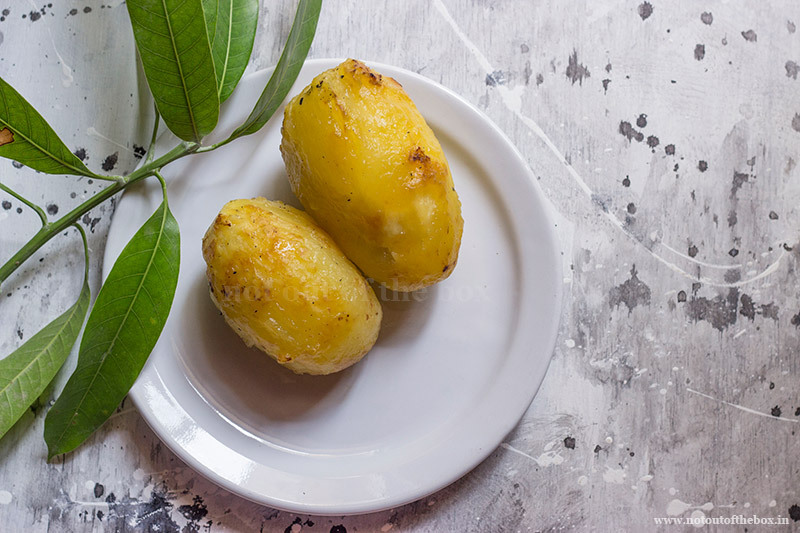 Don’t roast them on high heat, otherwise, they wouldn’t be cooked from the inside. After roasting transfer the mangoes in a bowl of cold water. Leave them for 10 minutes, now start peeling the burnt skin of the raw mangoes. Next squeeze out all the mango pulp and discard the stone, alternatively, you can take out all the pulp by using a knife. Dry roast the cumin seeds in a pan until fragrant and one shade darker in colour, keep aside. In a food processor add the roasted cumin seeds and black peppercorn, blitz until a coarse powder forms. This is the roasted spice powder for cooler, keep aside to use it later. 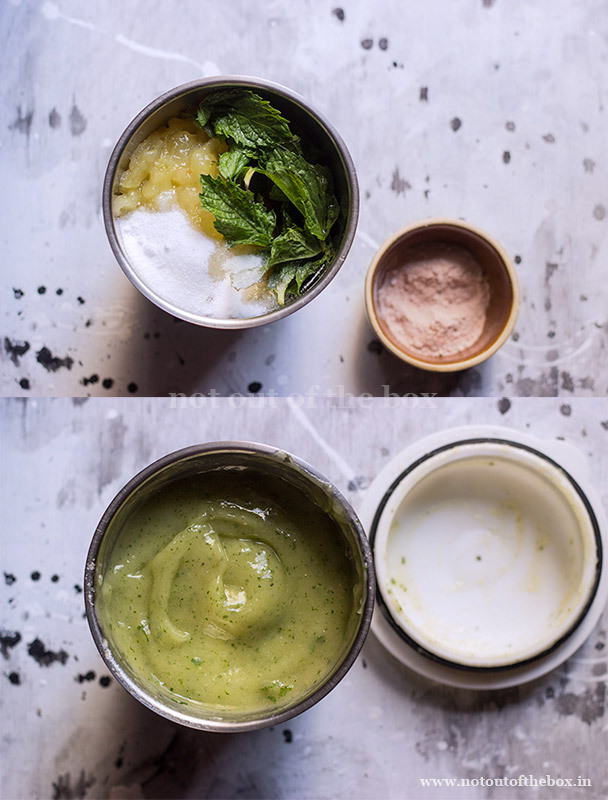 Add the mango pulp, sugar, black salt and mint leaves in a food processor. Blitz until smooth, strain this mango mixture through a strainer, keep aside. In a jug Add 750ml. of water, raw mango pulp mixture and 1 tsp of roasted spice powder, stir well. The consistency of this cooler would be a little thicker, so, adjust water accordingly. Pour in the glasses, add ice cubes and serve. For optional garnishing mix smoked paprika and salt in a plate. Rub lemon wedge around the rim of the glasses, now firmly touch the rim of the glass onto paprika salt until fully coated. 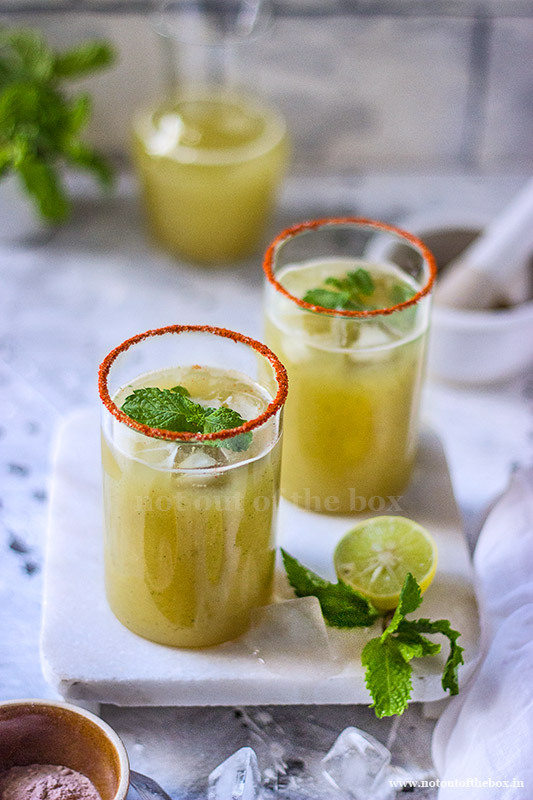 Popularly known as Aam Pora Sharbat, this Roasted Raw Mango Cooler is a memory laced drink from my Granny’s kitchen. Follow the easy, step-by-step recipe to make the refreshing summer beverage. In a jug Add 750ml. of water, raw mango pulp mixture and 1 tsp of roasted spice powder, stir well. The consistency of this cooler would be little thicker, so, adjust water accordingly.